imited places – registration required, see below! Our spatial awareness is dependant of only a fraction of a second of a sound reflected in our environment. This intuitive information is quite rudimentary when we navigate our environment and we are mostly unaccustomed to use it consciously and or adequately. Some animals, however, use it as their main navigation system. They ‘see’ with their ears. The skill has been first discovered in the mideighteenth century. The term echolocation was introduced much later in the mid-twentieth century. The Echolocator was first develloped for a site-specific installation at the Wasserspeicher for Singuhr Hörgalerie in Berlin. The idea for this installation is based on the concept that sound can be used for investigating acoustic and architectural properties. Sound can be be used as a cue for location, with sound we could be able to ‘see’ acoustic and architectural shapes. 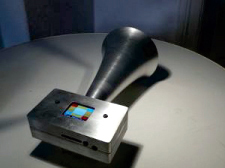 For this installation, a device that is a kind of sound space investigator – the Echolocator – was developed. The Echolocator incorporates a sound device, a laser beam, a communicating tracking device and a small screen that maps the space. It can emit short sounds, those used by animals for echolocation. There are in total a dozen of those devices. With the Echolocator spectators are able to explore the acoustic and architectural properties of a given space with sound. This tool triggers our sonic perception and helps in understanding how sound and space correlates. The device has been further refined to be able to use it also as a performance instrument. The performance is centred around the idea of moving and sensing into acoustic qualities of the space. It is based on the same sonic principles as described before. A space is divided in several acoustic zones and acoustic obstacles. Each zone has an assigned sound. Upon entering a zone the sound of the Echolocator will switch to the assigned sound. The obstacles have different materials, forms and micro-spaces. These obstacles will changes acoustic properties of the sounds. For example by using different materials (absorbing vs reflecting materials) and shapes (tubes vs open spaces) sound qualities will slightly differ. Each Echolocator has its own sound. The Echolocators also react with each other, when they all are close to each other they all sound the same. The installation/performance happens preferably in a completely darkened space to maximize the perceptual awareness of the senses. The audience is placed inside the performative space. Between 5 to 10 performers are asked to scan and listen to the space with the Echolocator. The score consists of specific instructions which divide the whole performance in smaller micro-events and actions that relates to a ‘critical’ listening of the performer.